For rapid absorption and fast pain relief. 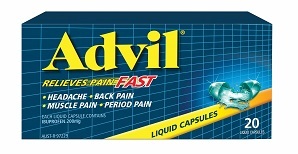 Advil provides temporary relief of pain & discomfort from: headache, period pain, sore throat pain, back pain, dental pain, cold & flu, muscle pain, minor arthritis pain, reduces fever. For use by adults & children over 12 years. Begin by taking 1 or 2 capsules, swallowed whole with water. One capsule will often be adequate for mild pain, but for more severe pain you may require 2 capsules. Repeat dose if necessary after 4-6 hours. Do not exceed 6 capsules in 24 hours, unless directed by a doctor. Children under 12 years: ask a doctor. This medication may be dangerous when used in large amounts of for a long time. If symptoms persist for more than 3 days consult your doctor. Keep out of reach of children. This preparation is for relief of minor & temporary ailments and should be used strictly as directed. Prolonged use without medical supervision could be harmful. Advil should not be taken if you have a stomach ulcer or other stomach disorders, have impaired kidney function or heart problems, or if you are allergic to or in the past, had side effects to aspirin, ibuprofen or other medication for pain relief/fever reduction. Ask your doctor before use if you have asthma, or are pregnant or nursing a baby, or are taking anticoagulant medication, medication for high blood pressure, diuretics, lithium, methotrexate or any other medication or if you are over 65 years of age or if you are under physician’s care for any serious condition. Do not use during the last three months of pregnancy.